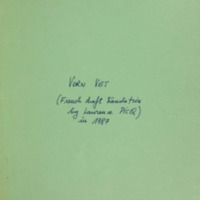 Vorn Vet a senior official in the Cambodian Communist party, was one of the leaders of the Cambodian "revolution" led by Pol Pot and served as Deputy Prime Minister of Democratic Kampuchea. He was arrested and executed in 1978. Includes a summary translation in French of the Khmer text. Except as provided in the Copyright Act 1968, this item may not be reproduced in any form without the written permission of Monash University Library.